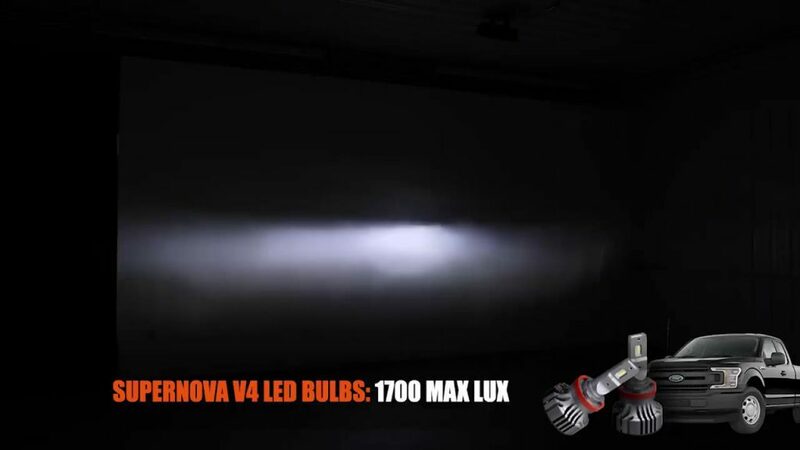 If you’ve ever asked the question what’s brighter hid or led, you probably know the answer. 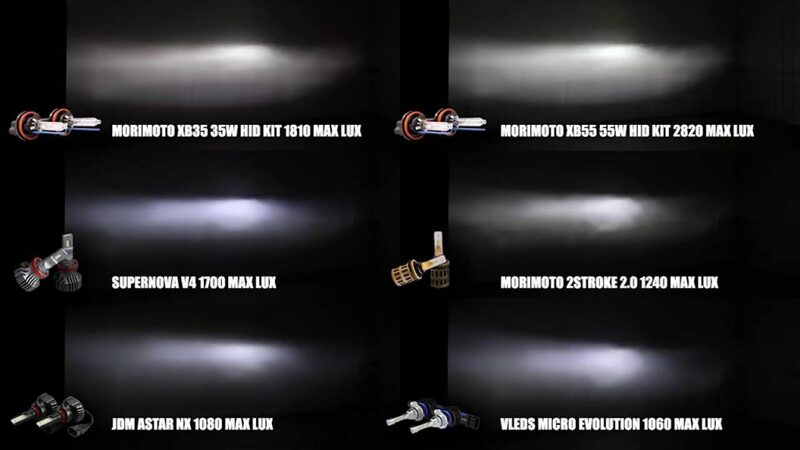 For years and years and years, HID headlights have been king of the hill in terms of brightness and beam pattern, but things are changing in this video, we’re going to line up four popular LED headlight bulbs to a 35 watt and a 55 watt Morimoto HID kit in this halogen reflector and halogen projector headlight and see what happens. 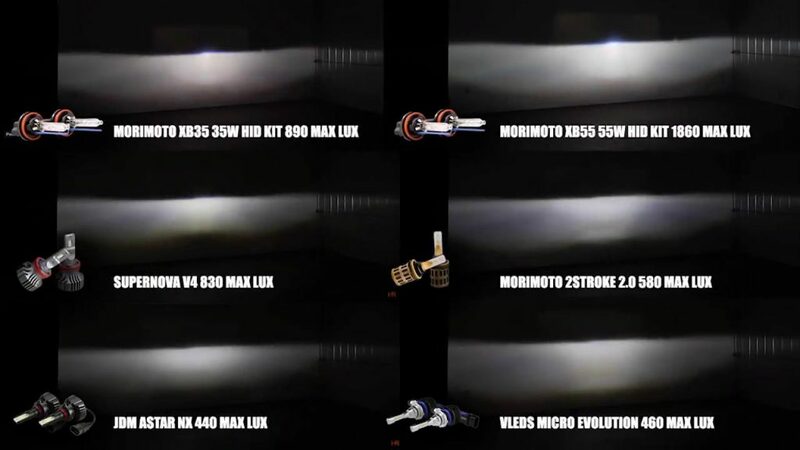 A lot of people ask us about the Morimoto XB line of hid conversion kits so that’s what we’re gonna use in this video. 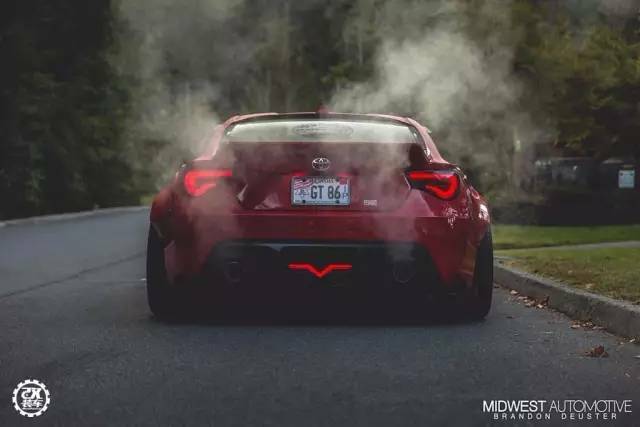 Our benchmark is gonna be a 35 watt HID kit that comes in at 3400 lumens and a 55 watt HID kit that comes in at about 4100 lumens from there. We’re gonna test the supernovae v4 LED headlight bulb that comes in at 3,600 lumens, next one is the Morimoto two-stroke LED headlight that comes in at 2440 lumens. The next bulb we’re testing is the JDM Astar NX that’s advertised at 10,000 lumens, which I think they’re saying 5,000 lumens per bulb equals 10,000 lumen, so we’re gonna call the JDM ASAR bull the 5,000 lumen bulb and then the VLEDs Micro comes in between 3420 lumens, their website isn’t quite clear on that. 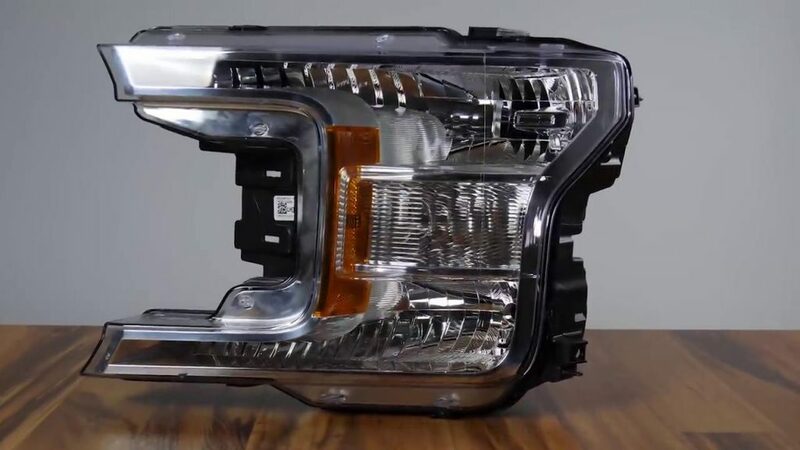 In order to get a good representation and give you the most accurate info, we’re gonna do the headlight testing on this 2018 Ford f-150 reflector headlight and a 2018 Dodge Durango projector headlight, that should give us a really good sense of how HID and these different LED bulbs work in different types of housings. 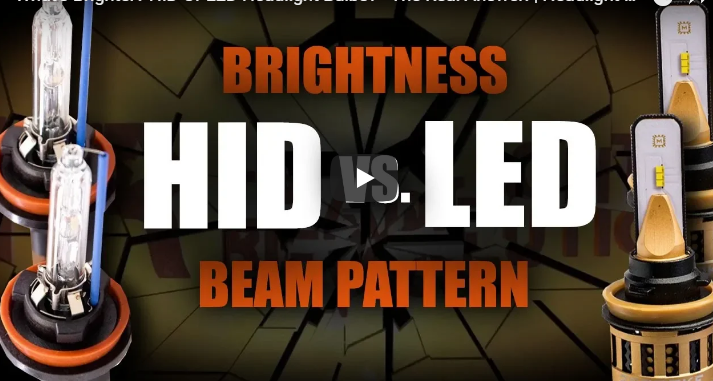 Of course this test won’t be completely conclusive because there’s many types of HIDs, there’s many types of LED bulbs, there’s many types of reflector and project. Your headlights i’ve been trying to give you a sense of what’s possible. 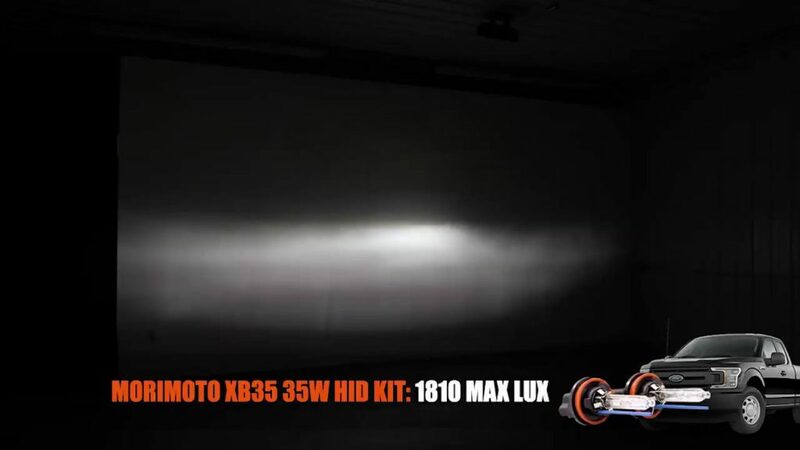 Here’s the Morimoto XB 35 watt HID kit with a 5500K bulb and it comes in at 1810 maximum looks at 25 feet. These lux numbers don’t mean anything outside of this test, it just shows the percentage of increase or decrease from one bulb to the next. Now here’s the Morimoto 55 watt HID ballast, it changes the color to a little bit more of a warm white, and it increases the lux to 2820 that’s a thousand more Lux than 35 watt. That is a massive increase in brightness. Here we have the Supernova v4 LED headlight. As you can see it’s more of a cool white color and the maximum Lux or usable brightness comes in at 1700. 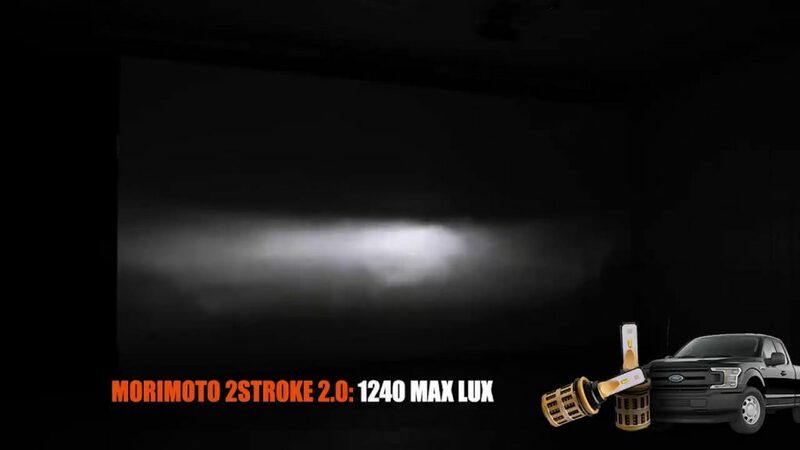 Here’s the Morimoto two-stroke 2.0 LED headlight coming in at 1240 maximum lux. Here’s the JDM ASTAR NX coming in at 1080 maximum lux. 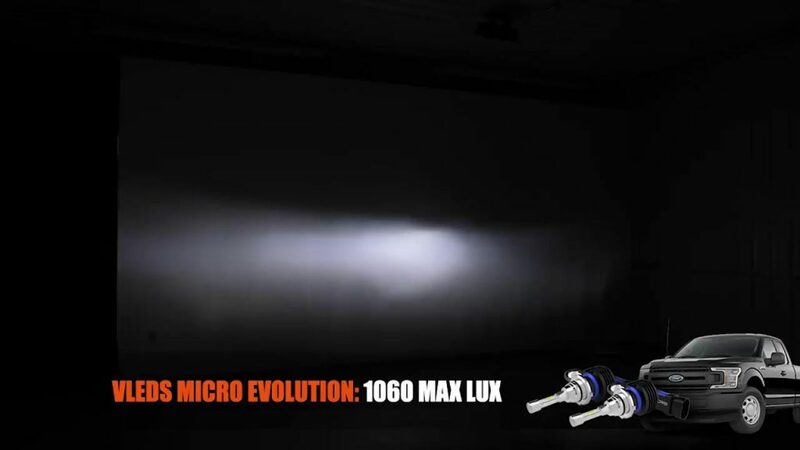 Here’s the VLEDS Micro Evolution coming in at 1060 maximum lux. 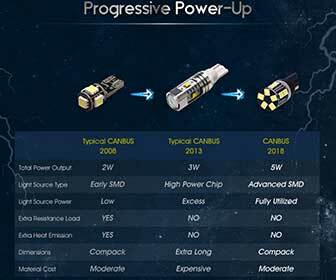 A comparison image below for your reference. First up we’re going to do the Morimoto XB 35. 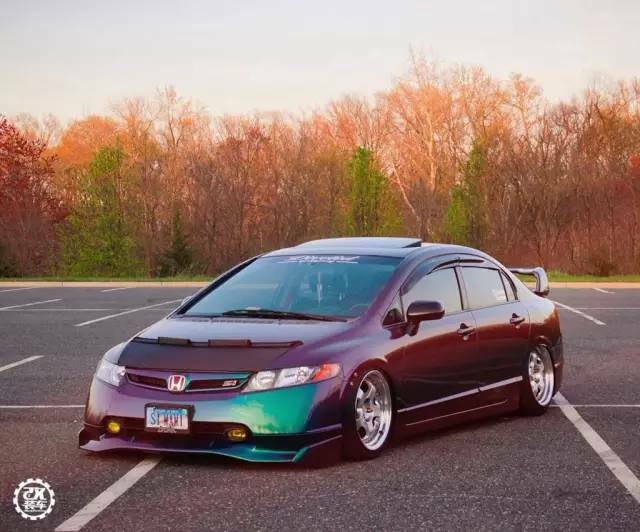 The 35 watt hid conversion kit it’s really interesting how much the housing itself has to do with the brightness. 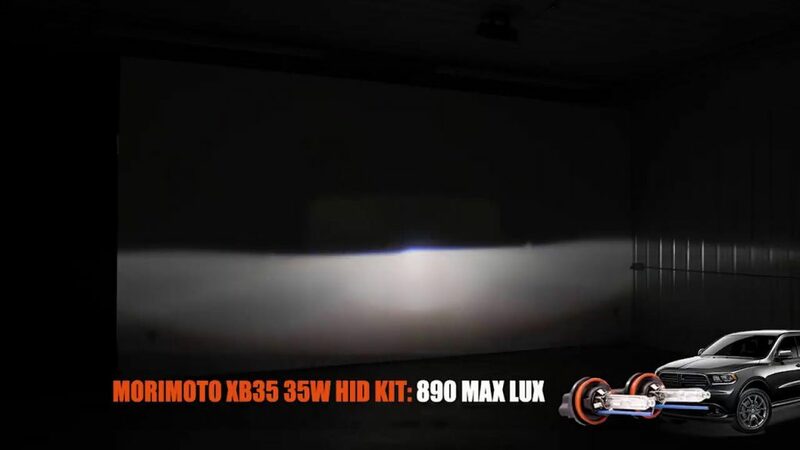 The 35 watt hid in the Durango headlight only comes in at 890 maximum Lux. It’s the same HID kit, it’s the same power supply, it’s the same distance from the wall, it’s the same meter but we come in at half the brightness. it really goes to show that your light source or the light bulb that you use is only half the equation now. 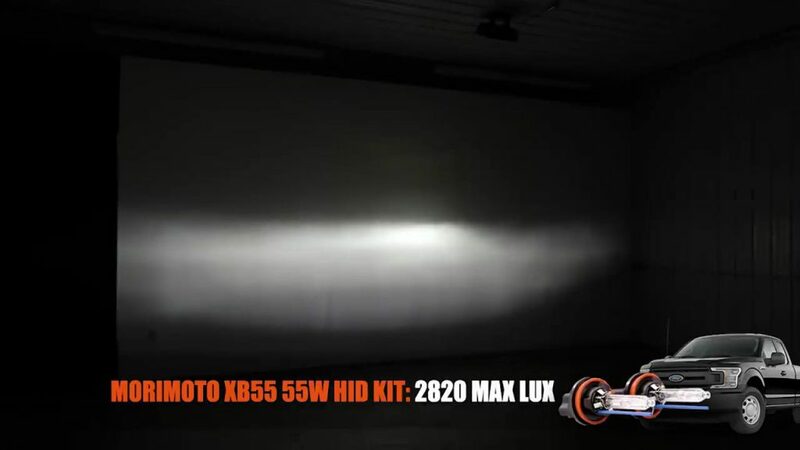 Here you’ve got the Morimoto XB 55, the 55 watt hid conversion kit. 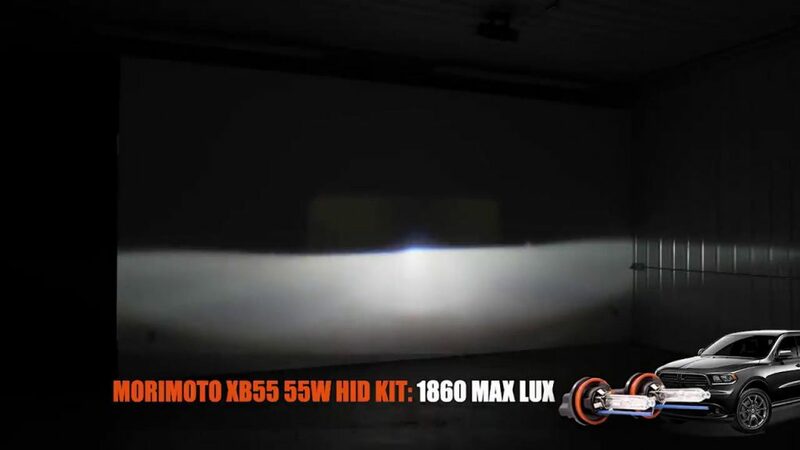 And just like the last test, the 55 watt jumped a thousand Lux, this one came in at 1860 maximum Lux with a more warm color temperature because of the higher wattage. 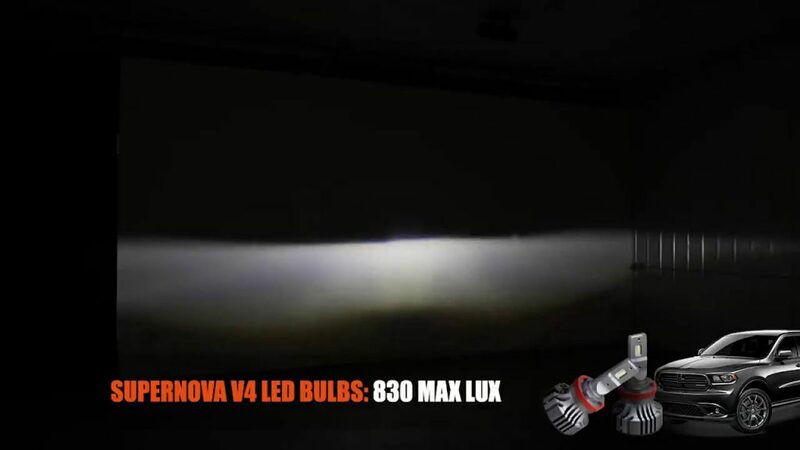 Here’s the supernova v4 LED headlight and it comes in at a maximum Lux of 830 at 25 feet. 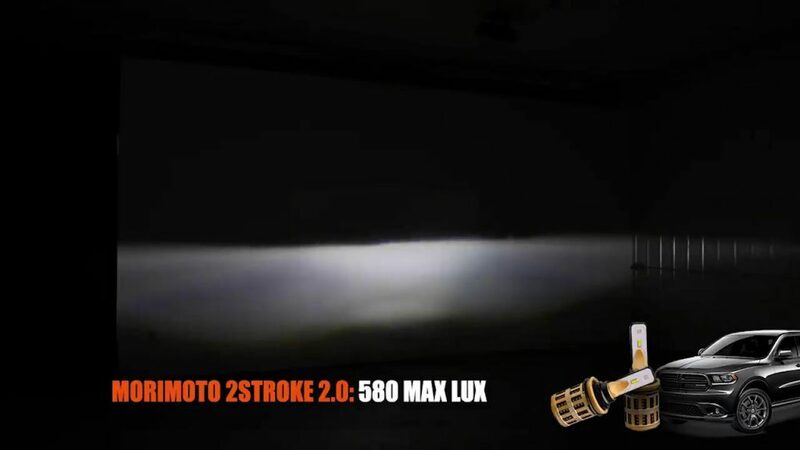 Here’s the Morimoto two-stroke 2.0 coming in at 580 maximum lux. 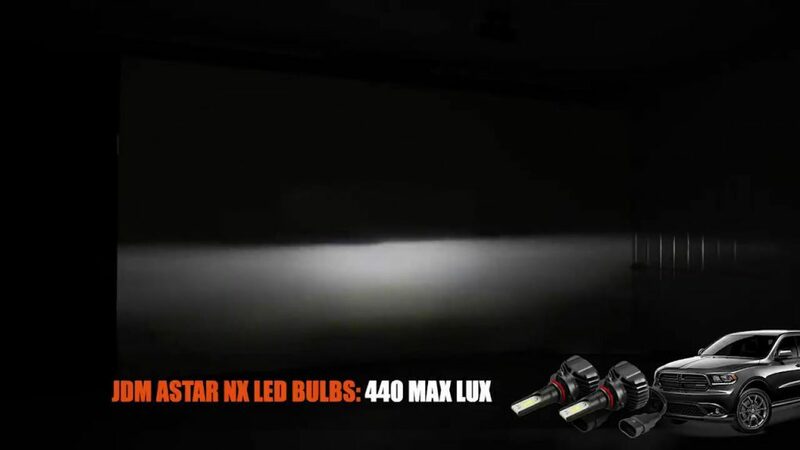 Here’s the JDM Astar NX LED headlight bulb, coming in at 440 maximum lux at 25 feet. 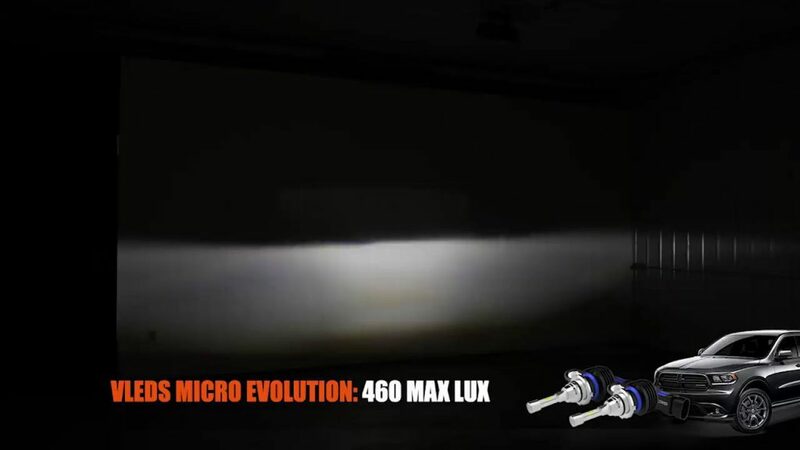 Here is the VLEDs Micro LED headlight bulb, coming in at 460 maximum lux. Well, there you have it, there’s the results. 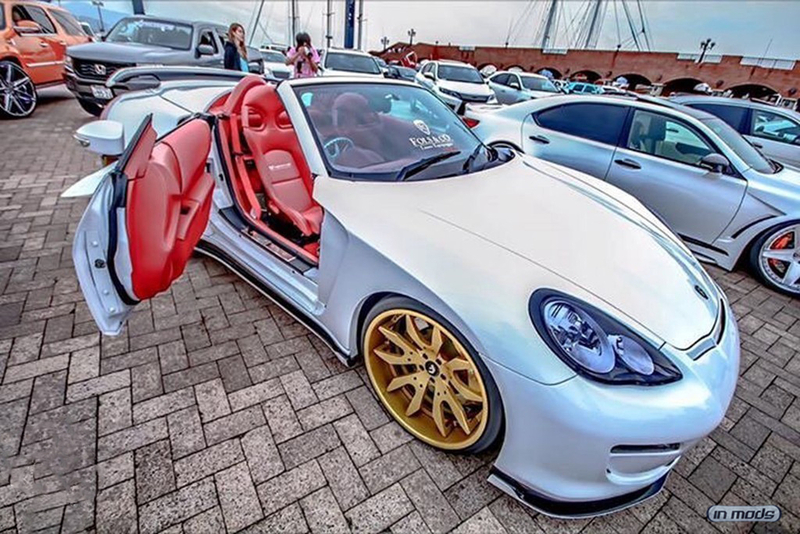 Were you surprised? I was surprised at how much more light up what we got out of the 55 watt hid. 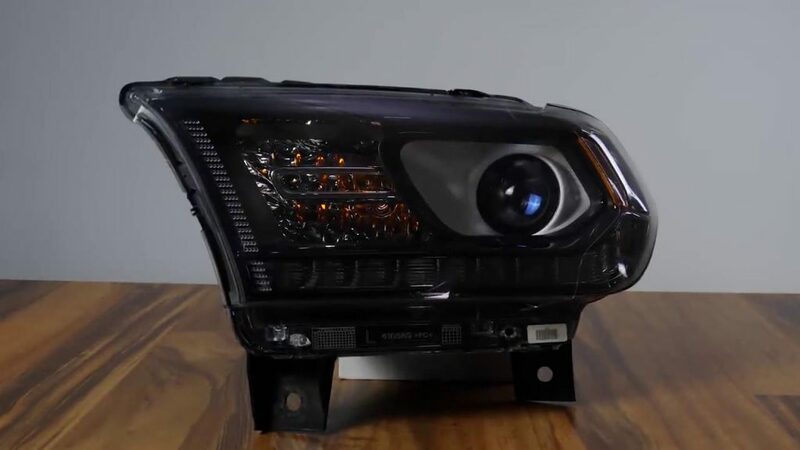 I was also surprised that the Supernova v4 in the Durango projector headlight had as much brightness as the 35 watt hid kid did. A year ago we couldn’t have even made this video, there’s no chance that an LED headlight bulb could be as bright as an HID, but nowadays we’re getting there. Soon maybe an LED would beat a 55 watt hid. I guess we’ll see.